Nahmad Contemporary is pleased to announce Georges Mathieu: Monumental Paintings, an exhibition of four monumental works by one of France’s most celebrated 20th-century abstract painters. 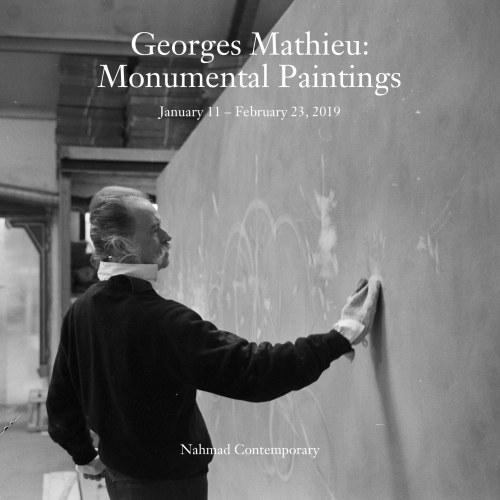 On view January 11 through February 23, 2019, these impressive paintings were created by Georges Mathieu (1921–2012) at age 57, at the pinnacle of his career and on the occasion of the artist’s 1978 retrospective at the Grand Palais in Paris. Each spanning over 19-feet wide and commandeering the gallery walls, the paintings are emblematic of the immense canvases for which he is most admired. Featuring dynamic lines thrusting outward in all directions and streaks of vivid paint, the four paintings embody the artist’s signature gestural style that is predicated on harnessing intuitive expression through speed and spontaneity. Previously kept in the artist’s personal collection and coming today from the artist’s estate, these sumptuous works are presented for the first time in the United States. Despite his fervid popularity at the onset of his career and the extensive acquisition of his paintings by major American and European museums early on, Mathieu has largely been overlooked in the past few decades. As such, this presentation provides the critical opportunity to reacquaint the public with a principal figure in the postwar art scene. The paintings presented in Georges Mathieu: Monumental Paintings—Souvenir de la maison d’Autriche (February 2, 1978), Samsum (March 21, 1978), Tuz Golu(March 22, 1978) and Zonguldak (March 30, 1978)—are four of seven canvases the artist specifically executed to accompany his 1978 retrospective at the Grand Palais in Paris as the pièces de résistance of his lyrical abstraction (one painting from this series of seven is now part of the Centre Georges Pompidou’s permanent collection). The titles are typical of the artist, who often chose offbeat and poetic monikers for his works referencing history, music and geography. Emphatically received by the public upon the exhibition’s inauguration, this important group of works embodies his ultimate expression. Playing a decisive role within the abstract expressionist movement, Mathieu pushed the boundaries of painting in the late 1940s and early 1950s during the movement’s burgeoning across Europe and the United States. He diverted from the geometrical abstractions that dominated the previous era with a visual language that favored form over content and gesture over intent, and aimed for uninhibited creative expression. He termed this newfound aesthetic “abstraction lyrique” (lyrical abstraction), after a description of his work by French critic Jean José Marchand in 1947. His works are characterized by a calligraphic quality of line that he created using long brushes and by applying paint directly from tubes onto the canvas. The immediacy and rapid execution of these distinct methods guaranteed the freedom with which he defined his oeuvre. During the 1950s, Mathieu executed large canvases before audiences, a performative aspect that rivaled Gutai, the Japanese avant-guard group and anticipated the work of Yves Klein and the “Happenings” in the United States. Likewise, the energetic mode of painting and the large-scale workings of artists such as Zao Wou-Ki are largely a response to his discovery of the French expressionists, particularly Mathieu, upon his visit to Paris in 1957. At a time when Paris was the center of the art world, Mathieu, who was fluent in English, played an important, intermediary role between the European and the American art scenes. As the founder of lyrical abstraction, a pioneer of action painting and forefather of performative painting, Mathieu’s oeuvre exists as the transatlantic counterpart of abstract expressionism. In 1952, Alexander lolas gave Mathieu his first solo exhibition in New York at the renowned Stable Gallery. On the occasion of the show, The New York Times called the artist, “one of the most fervid of contemporary French abstractionists,” and in 1954, the newspaper affirmed him an abstract expressionist as powerful in Paris as Willem de Kooning is for Manhattan. He was represented by Samuel M. Kootz in the United States from 1954 to 1960 and was the subject of solo shows at Alexander lolas’s Gallery in 1965 and Wildenstein in 1979. Most recently, a vast painting by Mathieu was featured as a highlight of Basel’s 2018 Unlimited sector, curated by Gianni Jetzer. The exhibition at Nahmad Contemporary is the artist’s first in the United States in over 30 years. Georges Mathieu (b. 1921, Boulogne-sur-Mer, France; d. 2012, Boulogne-Billancourt, France) began to paint in 1942 at the age of 21 after studying languages, literature, law and philosophy at a variety of institutions in France. His professional life extended beyond painting to include roles as a professor, interpreter, public relations director, writer and theorist. The artist participated in many other cultural endeavors that allowed for artistic engagement with the public. He advocated for the presence of art in France’s national education system, contributed to urban architectural plans and designed travel posters, television logos, stamps, and the 10-franc coin. His work has been the subject of numerous retrospectives, including those at Musée d’art moderne de la Ville de Paris (1963); Grand Palais, Paris (1978); and Jeu de Paume, Paris (2002). 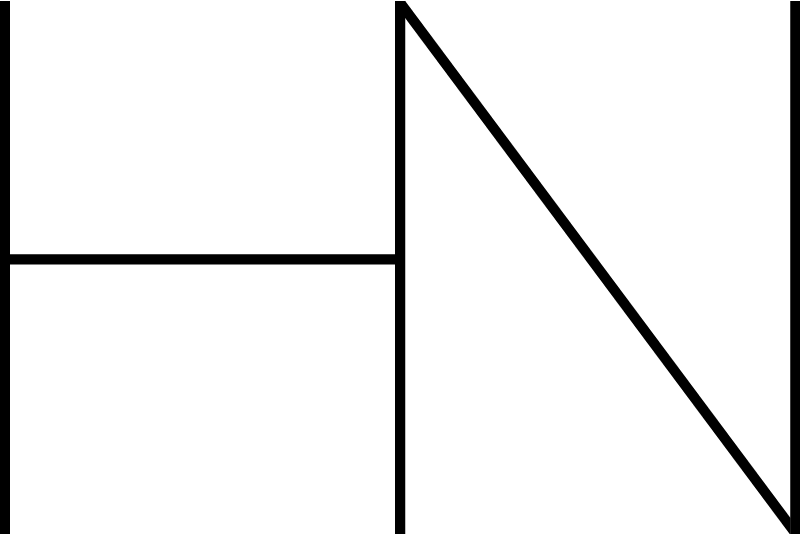 Other notable solo exhibitions were presented at the Institute of Contemporary Arts, London (1956); the Kunstmuseum, Basel (1958) ; the São Paulo Museum of Modern Art (1960); and the Musée des Beaux-Arts de Nantes, France (1966). His work is currently held by more than 80 museums and public collections, including the Art Institute of Chicago; the Centre Georges Pompidou, Paris; the Hirshhorn Museum and Sculpture Garden, Washington, DC; the Kunstmuseum Basel; the Kunsthaus Zurich; the Museum of Contemporary Art, Los Angeles; the Museum of Fine Arts, Houston; the Museum of Modern Art, New York; the Musée National d’Art Moderne, Paris; the Solomon R. Guggenheim Museum, New York; and the Tate, London.